Asia is forecast to be the major contributor to the growth of the global refinery coking units industry between 2018 and 2022, accounting for around 38 per cent of the global planned and announced refinery coking unit capacity additions by 2022, according to GlobalData, a leading data and analytics company. The company’s report: ‘Global Refinery Coking Units Outlook to 2022’ forecasts that around 1,170 thousand barrels of oil per day (mbd) of planned refinery coking unit capacity will be added globally by 2022, taking the total global refinery coking unit capacity to around 10,267 mbd by 2022. Asia also has the highest new build capital expenditure (capex) spending globally with around $9.8 billion during the 2018–2022 period, said the report. Among the countries in the region, China will have the highest planned refinery coking unit additions of 200 mbd by 2022. 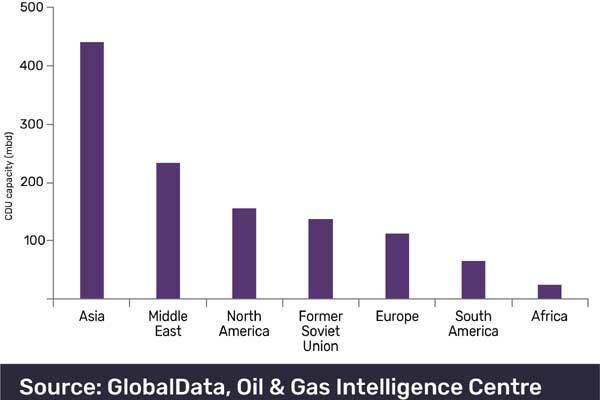 GlobalData identifies the Middle East as the second highest in terms of refinery coking unit capacity additions. The region will add around 233 mbd of coking unit capacity and has planned capex of around $2.6 billion by 2022. Saudi Arabia will be the top country in the region with planned refinery coking capacity additions of 104 mbd during the outlook period. North America is the second highest among the global regions in terms of new build capex spending for refinery coking capacity additions, with around $6.9 billion between 2018 and 2022. The region is expected to add around 156 mbd of planned refinery coking capacity by 2022. Among the countries in North America, Mexico will lead with planned new build capex spending of around $4.5 billion during the outlook period. In terms of capacity, Jieyang refinery in China, Pulau Muara Besar refinery in Brunei and Jizan refinery in Saudi Arabia are the top three planned and announced refinery coking units for the 2018–2022 period with capacity of 153 mbd, 114 mbd, and 104 mbd respectively.